This half-hardy plant is much loved by gardeners and cooks alike. Cuminum flowers in the middle of summer with white or pink flowers; its seeds should be harvested for use in the kitchen. The common name for Cuminum is cumin, and it will reach an height of about 12 to 15cm. As soon as the pods of cumin go brown they should be harvested. The pods should be dried, then rubbed; this will release the cumin seeds from the pods, which can then be used directly in culinary dishes or stored in an air tight container for future use. Native: Mediterranean, West and Central Asia. Flower Details: White, pink. Umbels. Tiny. Sow Outside: 1/4 inch (6mm). Spring; minimum temperature should not drop below 60°F (15°C). Spacing: 4 inches (10 cm). Sow Inside: Peat pots. Germination time: one to two weeks. Temperature 70°F (21°C). Seven or eight weeks in advance. Transplant outdoors when temperatures do not drop below 60°F (15°C). Requirements: Four month growing season with temperatures of 86°F (30°C) for best results. Full sunlight. Good drainage. Fertile Soil. Give feed at same time as transplanting. Miscellaneous: Usually grown for its seed, therefore cover seed-heads with a bag to harvest. It is perhaps best to start Cuminum seedlings off indoors. They should be grown in peat pots. Sow the Cumin seeds at a depth of about 6 mm. It should take about two weeks for the cumin seeds to germinate when kept at about 20 degrees Centigrade. The Cumin can then be transplanted outdoors in the middle of spring, well after the possibility of any frost at a spacing of about 10 cm. They prefer to grow in an area that is sunny and will thrive in a fertile soil. The Cumin plant makes an ideal addition to any herb garden. 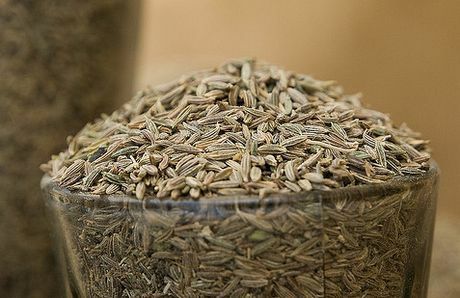 Cumin should be watered during dry spells and hot weather to increase its yield.